The Underwood Public Library Board of Trustees will meet Tuesday, December 22nd at 6:00pm at the library. This is an open meeting. Afterschool Summit- Need for formal afterschool tutoring/activities? In celebration of the up-coming movie release of “Mockingjay: Part 2”, the Underwood Public Library will be hosting a Hunger Games movie trivia night and shooting gallery event. This event is scheduled for Friday, November 13th and is open to students in grades 6-12. Trivia will start at 6:30PM at the library. Trivia will be hosted on the Kahoot site. Students are encouraged to bring their personal smart phones or tablets to participate, but the library has a handful to loan out during the event. Shooting gallery will run from 7:15-8:00pm. Use the library’s rubber-tipped guns, bows and arrows to shoot the Peace Keepers and President Snow, but keep Katnis Safe! Hunger Games themed snacks will be provided. Got History? Join us for Digital Scan Day! 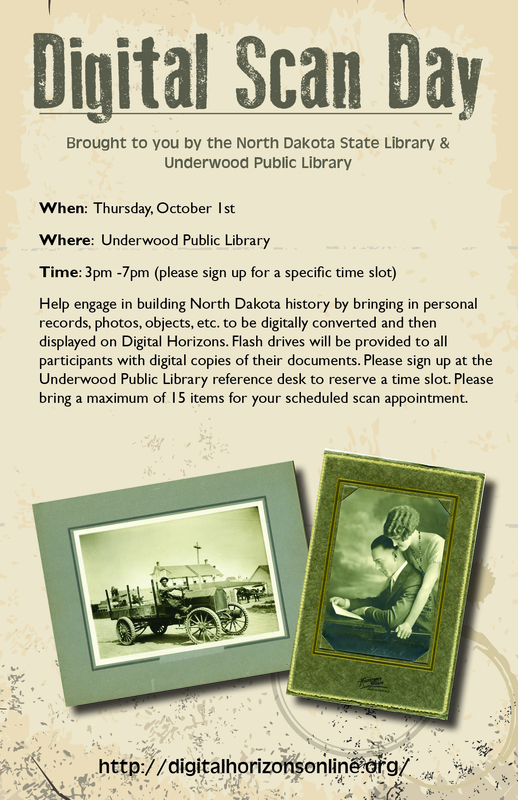 Bring your old (and not-so-old) photos, documents and items of North Dakota for inclusion in the Digital Horizons website and receive a copy to take home on a thumb drive, October 1st from 3-7PM. Schedule your appointment today! Librarians will also be on hand to answer any questions about mobile devices and introduce you to our e-books and other services for mobile devices. The Underwood Public Library Board of Trustees will meet Tuesday, June 2nd at 4:00PM at the library. This is an open meeting. The agenda for this meeting is posted on the library door. Kids ages 4-12 years-old are invited to kick-off our Summer Reading Program by dressing up as their favorite hero or super hero, capturing villains and creating some shadow art! Friday, May 22nd from 4:30-6:30PM at the Underwood City Hall. There is a limit of 48 kids, so pick up your registration form at the library today! Dinner and dessert are provided. There is a cost of $5/child.